Nishime, LeiLani, edited by Bailee Martin, podcast of Interview with Lori Kay, from Race in Public: Expanding the Public Conversation about Race, January 4, 2014. Short, Steven, Meet the woman behind the new Peninsula Museum of Art, Crosscurrents, Kalw 91.7 FM San Francisco, article features a photo of Lori Kay’s artwork at the East Gallery of the Peninsula Museum of Art. Cheers to Muses: Contemporary Works by Asian American Women, Asian American Women Artists Association (January 2007), San Francisco. Bay Area Backroads,”Down in the Dumps”, K-RON TV Channel 4. Bay Area Personalities,”Another Man’s Treasures”, KTVU TV Channel 2. Christine Lias,”Artist’s Work is Trash, Literally”, Los Gatos Daily News, December 26, 2003, p.1, 5. 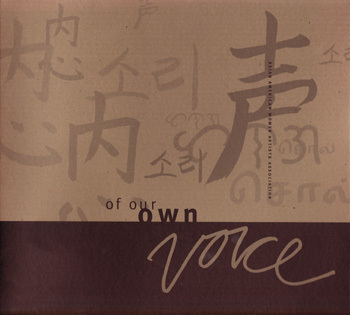 Of Our Own Voice, Asian American Women Artists Association. “P.I. 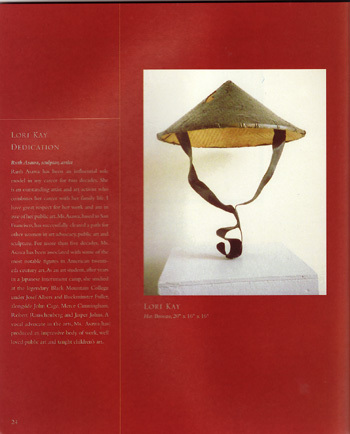 Made In America,” Filipino American Artist in the Pacific Northwest, Wing Luke Asian Museum catalog. Unzipped | For Lori Kay, gold was the color that came closest to representing truth, beauty and love, the highest attributes that are revealed by the unzipping and undraping of the heart. Gold has a rich history of symbolism in many cultures, religions and art traditions. The artist applied most of the heart’s 40 something luminous layers at dawn, while her twin daughters were sleeping. “Detail”, A Journal of Art Criticism, Vol 4, Number 2, 1997 p. 2-3. “Diversity, Interviews of the Artists”, Palo Alto Cable TV, Ch. 6, Feb. 1997. Nora Villagran, “Making a Wish Artistically”, San Jose Mercury News, June 21, Cover, p. 3-4. “Women Artists of Color”, Video, National Women’s Caucus for the Arts, United Nations NGO, Beijing, China. “Bronze Sculpture Unveiled in Mt. View”, Palo Alto Daily News, Jan. 14, p. 13. Tuchman, Laura. “Half Breed or Whole Person”, San Jose Mercury News, Dec. 15, Cover, p. 16-19. Workman, Bill. “Searching for a Whole Identity”, San Francisco Chronicle, Dec. 8, p. 1. “Walk in her Moccasins, Biracial Artist Asks”, The Times, Dec. 8. Cheek, Jennifer. “A Wish Fulfilled”, Half Moon Bay Review, March. Curry, John. “HMB Gets its First Public Sculpture”, The Times, Mar. 13, p. 1, A3-4. Ameli, Venus. “Women, Culture and Self-Expression”, KMTV (Ch. 6), May-June.“Casting a Wishbone”, 11 PM News, KNTV (Ch. 11), January 20.Green, Marilyn.“Sculptor Casts Her Wish”, Boutique & Villager, Hillsborough-Burlingame, Feb. 2, p. 1 & 2A. Rothman, Jason. “Art Beat-Brains and Bronze”, Metro, Jan. 27, p. 29. “Retrospective Sculpture Exhibit at Ledbetter Focuses on Female Form”, The Carmel Pine Cone, Feb. 10, p. 32. Blair, Erin. “Student Union Displays Asian Art: Art Represents Identity and Talent”, The Golden Gater, Sept. 10, p. 12. Worthington, Robin. “In the Doghouse ?”, San Jose Mercury News, June 9, p. 1B and June 10, p. 4B. Graham, Jerry. Bay Area Backroads, KRON (Ch. 4), November. 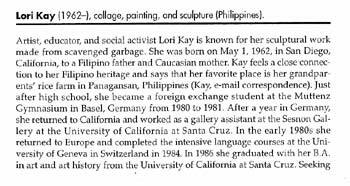 “… Lori Kay’s father is Filipino, and her mother is European American. Their marriage would have broken anti-miscegenation laws in her mother’s home state of Virginia, so they were married in Washington, D.C. One of Kay’s earliest memories is of a woman pointing at her in her stroller and hissing, “You’re a sin!” Her “Heir to Rice” (1999) is a small sculpture that is at once understated and splendidly eloquent. It comprises a conical straw hat that holds its shape and seems able to float above the ground, even though it is coated in bronze. Its subject is courage. Encaustic Paintings from the Half-Breed exhibit HALF-BREED: AN ARTIST PONDERS RACIAL OBESSIONS AND MIXED-RACE IDENTITIES HALF-BREED OR WHOLE PERSON?